Serenely embellished in the heart of a spectacular canvas known as India, Madhya Pradesh reflects the rich heritage of the country. Other than being a prime cultural, wildlife and heritage hub, this state is also a prominent spiritual spot. Places like Indore, Ujjain, Maheshwar and Omkareshwar serve as ideal spots for tourists with spiritual souls to experience tranquillity and peace of mind. The spiritual seats here have great religious significance. 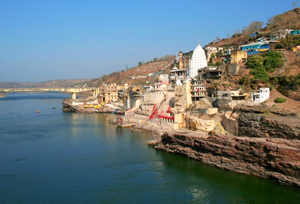 For instance, Omkareshwar and Maheshwar Temples are among the 12 Jyotirlingas of Lord Shiva. 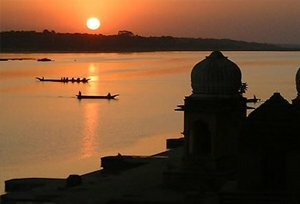 This 04 Nights and 05 Days of itinerary take the travellers to a comprehensive and peace providing spiritual tour to Madhya Pradesh. The major destinations covered in the tour are Indore, Ujjain, Omkareshwar and Maheshwar. The tour is ideal to explore the revered pilgrimage sites of Madhya Pradesh and soak its spirituality and holiness. On arrival at Indore railway station or airport, meet our tour representative who will be there for your welcome and thereafter to take you to Ujjain by road, which is about 1 hour 30 min journey. On reaching Ujjain, check-in at the already booked hotel. The rest of the day is free for leisure. During your free time, you can explore the lively streets of Ujjain or simply stay in the hotel and take pleasure of its modern amenities. Enjoy an overnight stay in the hotel in Ujjain. Ujjain is acknowledged for Kalidasa and its most popular composition, Meghdoot. It is also known as adobe for Lord Shiva. 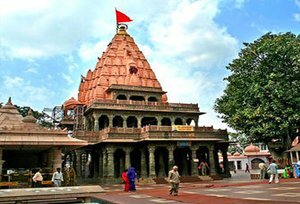 Today after breakfast in the morning, we will begin our Madhya Pradesh Pilgrimage tour and pay a visit to the Mahakaal Jyotirlinga temple, a famous Hindu temple located in Ujjain that grab attention of thousands of devotees from across the globe. Thereafter, we will visit other ashrams and temples of Ujjain such as Sandipani Ashram, Chousat Yogini, Gopal Mandir, Bade GaneshJi, Harsiddhi Mandir, etc. After exploring these temples, we will head towards holy ghats of Kshipra River like Ramghat to enjoy boating. Later in the evening, we will drive to Omkareshwar, which is about 3 hour 30 minutes journey. On arrival, check in at the hotel for a relaxing overnight stay. After breakfast, we will head out to pay a visit to temples of Omkareshwar. To start with, we will first visit the Mamaleshwar temple, which is devoted to Lord Shiva. It is one of the 12 Jyotirlingas located in India. One needs to walk on the Mamaleshwar Setu to cross the river and reach Mamaleshwar temple located on the other side of the river. Thereafter, we will visit Varhdheshwar temple, Annapurna temple, Gouri Somnath temple. Later, explore the holy ghats such as Nagar Ghat, Abhay Ghat, etc. situated on the bank of Narmada River. In the evening, we will drive to Maheshwar that lies on the west of Omkareshwar. Enjoy an overnight stay in the hotel in Maheshwar. 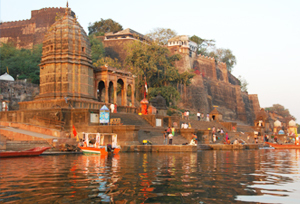 The day is fixed to explore Maheshwar town that lies beautifully on the bank of Narmada River. Developed during Holkar dynasty under the supervision of Rani Ahilyabai Holkar, the town was once the capital of Holkar dynasty till year 1818. We will start our day tour by visiting two of the major attractions of the town i.e. Ahilya Fort and temples. Thereafter, we will enjoy boat riding in Narmada River. In the evening, we will drive back to Indore. Have a comfortable overnight stay in the hotel in Indore. On the last day of our holy tour, we will proceed for Indore city tour in the morning after breakfast. In our Indore day tour, we will visit the major tourist destinations of the city including Lal Bagh palace, Kishanpura Cenotaphs, Rajwada Palace, Lalbagh Museum, Khajarana temple, Zoological park, etc. After exploring these places, you will be transferred to the airport/railway station to board the flight or catch train for onward destination.